The Queen's Head is a traditional pub that's popular amongst the local community. They serve a variety of drinks and classic pub grub. Do you work at Queen's Head? Garden at the back of the pub. What did you think of Queen's Head? I took some relatives to the QH for sunday lunch on 18.12.12. What an embarrassment! We all ordered a roast dinner. All were served luke warm. The yorkshire pudding was soggy in the middle and rock hard towards the outer edge. The very small amount of veg we got was over cooked, the beef tough and we each got two tiny roast potatos. The apple crumble was dire. It was all apple and hardly any crumble. The middle part of the pudding was very hot but stone cold towards the edge of the dish(maybe a little extra training is required around microwave settings). The waitress who served us our food was pleasant enough but the sullen barman that took my drinks order at the bar treated me like I was a hindrance - how dare a customer interrupt him slicing lemons up to buy some drinks. I asked for no ice in the coke but got ice, I asked for an orange juice and lemonade and got lemonade. The change was given to me without a word or any eye contact. It seemd as though he couldn;t wait to get back to the more important aspects of his job - slicing lemons. Why oh why do people choose to work in the service industry when they clearly don't like working with people. I wouldn't recommend this place to anyone. 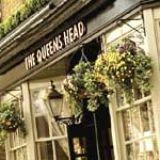 If you want to escape the busy Westfield shopping centre and tourists in the are, Queens Head pub is the place to go and unwind! The pub garden is one of the best, if not 'the best', in the area. Perfect for a shandy in the summer sun with a group of friends. The Queen’s Head is a quality Fuller’s pub and the family-owned brewery, responsible for London Pride among others, is only based down the road from here on the banks of the river Thames. For a company that has invested in the area for the best part of 160 years, this country-esque boozer is a good example of their ongoing relationship with locals. Brook Green is a very different Hammersmith to the concrete spaghetti junction people typically associate with the area around the Broadway. On the Green, there’s a nice leafy feel, with huge houses around the perimeter and a very civilised air all-round. This pub sits among the residential piles, along from St Paul’s Girls’ School with its wall dedicated to the classical composer Gustav Holst, who even wrote a titular piece dedicated to the area. The Queen’s Head looks fairly modest in size from the outside but, once inside, it turns into a huge space that looks like it’s been plucked from the countryside and plonked down in W6. 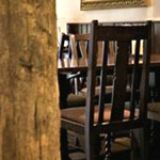 Exposed wooden beams and pillars make you reminisce about steak and carvery country pubs of your childhood and, to the rear, there’s another pleasant surprise – a huge outdoor garden area that bristles with banter on sunny evenings. Locals flock to the Queen’s Head for a bite to eat and plenty to drink. Most are fairly well-to-do types, whether they’re residents from the Green or the nearby streets where semi-detached houses fetch the best part of several hundred thousand pounds. Staff are plentiful and do a sterling job even at peak times. Burgers, fish and chips, steak, and gammon, egg and chips – there’s nothing out of the ordinary here. But what you do get is decent quality pub grub in hefty portions. The battered hake and chips (£8.95) with mushy peas is particularly good. Light batter, flaky fish and chunky chips using good quality spuds combine for a very respectable version of the dish. The rump steak is not as impressive. A huge serving is a little tough in parts and isn’t much better than what you could dish up at home with a little effort. Fuller’s ales, naturally, run things at the pumps. Pride, HSB and Seafarers are just three of those available for around £3-£3.50 a pint. A comprehensive selection of wine and spirits are also on offer. Bottles of ice-cold Rekorderlig cider also appear a popular choice with those in attendance. A lovely pub in the heart of a leafy, well-to-do part of Hammersmith, the Queen’s Head has plenty going for it and is evidently a much-loved part of the local community. I visited this pub last week for the first time (Sunday 27th March 2010) and was struck how one member of staff ruined what was otherwise a very pleasant lunch in a nice pub. 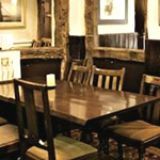 The food is tasty and competitively priced and the pub looks lovely and well looked after. I went to the bar to order my first course and drink and the member of staff barked the amount at me with no please or thank you then silently took my money and gave me my change. She seemed put out that I wanted to order more than one thing. I did not think much of it other than that she wasn't very polite. I hoped to get another member of staff next time I went to the bar. Unfortunately I got her again the second time I went to the bar to order desert. I asked for 'the chocolate brownie', she answered, 'the fondant? the cake?' I said 'no, the brownie'. She looked at me blankly and said 'we don't have...' I answered 'oh right, well it's on the menu'. She silently handed me a copy of the menu with raised eyebrows. I pointed at the option of the brownie and she silently put it on the till and barked the total at me with no acknowledgement of her mistake and again, no please or thank you. I was at a friend's birthday so did not want to make a fuss, but I have to say I was appalled at this rude treatment. I will not go to this pub again in a hurry which a shame as it seems to be a good place in other respects. Sunday roast dinner is best of the week so they say . If you like your dinner luke warm , not much of it, [ except big york-shire pud ] trio of meats [ one very small slice of 3 meats ] cold veg little potatoes [ I mean very small amount and lukewarm] then this is pub for you . I have tried many public houses for lunch and this was one of the worst . If your looking for a good lunch and value for money [ 8.95 ] be nice to yourself try elsewhere. I think the pub was taken over by different a management team around July 2008. They took it by the scruff of the neck and have now turned it around to a great family pub(children & dogs allowed). As has been said the food is a little on the dear side but always excellent and my granddaughters love it as there spoilt rotten. So Luna I'd give it another go. I've been to The Queens Head a few times now and never been disappointed. Firstly the essentials, it's a Fuller's pub, the service is efficient and friendly, the drink is very good, with Pimm's, a variety of lagers, ales, wines and the usual spirits to choose from (though it's not cheap it's average for the area and I'd rather pay a bit more to be somewhere good). The pub's in Brook Green, which is a very nice area. If you sit at the front of the pub you get a good view of the green, then there's the majority of the seating into the pub which extends quite a way on the right and after that is a garden which won't be bettered easily, though it does close at 10. The food is very good and ranges from about £8 to £12, which I suppose is pretty good value as I've not been disappointed by it. A special mention has to go to the Sunday Roasts here - I went for one for the first time this week. The place was pretty packed when we got in though I saw you could reserve a table if you want, and soon we found why as the roast was great. It won't be a pub for everyone, though - this isn't a sports pub or anything like that, probably understandably because of the area, so there are no tvs to watch any fixtures. Also some of the decoration is more on the modern side so it's not your 'old school pub', though it's been there long enough to be one. But what it is is a great pub to go with friends, go for something to eat and drink with your partner or work colleagues and enjoy your surroundings. The Queen's Head is now an excellent pub, having changed a great deal from years ago when the main review was written, which inspired me to write this. Now owned by Fullers, the staff are excellent, as are the drinks. The food is also good if expensive, but being in Brook Green it's bound to be on the expensive side. 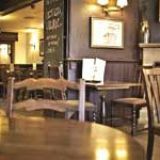 The pub itself is spacious, with plenty of seating, even when it gets crowded in the evenings. As for the garden - it's the best I've seen in London by a long way. I recommend it without hesitation, having spent a fair few enjoyable hours in the place. I had not been to the Queens Head for some 30 years, we were planning a family birthday celebration and wanted to try somewhere different, and the Queens Head was recommended to us by my son, who has recently moved to Hammersmith. We were not disappointed, the food was excellent, with generous portions, plenty of room in the restaurant area and a lovely garden. We were a party of 5, and with three of us choosing starters and mains, (the other 2 just had mains) plus drinks the bill came to a very reasonable £83 - I am already looking forward to visiting again, and working my way through the menu. An excellent place to eat and drink. The Queens head is, from both the outside and inside, an attractive pub and is certainly one of the nicer pubs in London. Filled with lively decoration, it boasts superb surroundings in which to eat a good and proper English meal. The extensive menu caters for all tastes, with excellent starters and deserts on offer. The food is served hot, and it tastes bloody good. The sausages and mash is highly recommended, along with the soup for starter. The soup in particular was devine, served with warm bread to take the edge off that cold day. The wine list seemed to go on forever, but being on a budget I did not much need to look at half of it. Still, as Melody123 says, it is cheap for London. The staff seemed very friendly, although one man seemed to be trying a little too hard and had an oh-so-fake smile fixed upon his face for the entire evening. Still, anyone smile is better than no smile. I rate this pub as being top-notch, and give it a 5 out of 5. I look forward to going again. I walked past the Queens Head a couple of times and I always thought it looked like a lovely pub. So I was planning on going and I googled it. I read many bad reviews on this website and almost changed my plans tonight for that reason. We still went and had a really good time. The place is well decorated and full of warmth. It feels like a cosy pub and the atmosphere is friendly. Christmas music was playing, the neighbouring table was having christmas crackers, people were laughing and sitting in that pub put a smile on my face. The staff was friendly and food was ready shortly after having ordered. I recommand the goats cheese and beetroot fondue which was just delicious. I had a beef and ale pie for main course which also very tasty. Prices arent too expensive, considering it's in London. I would definitely say that it is a very good pub for a drink or a meal. I dont understand where the bad reviews come from, it almost seems like I have not been to the same pub! It was also quite busy so it cant be that bad! It really doesnt deserve these reviews. This evening was one of the best dinners I have had in while and I will surely go back to the Queens Head. What an appalling lack of service! The Queen's Head will not be getting any further business from me! Aside from the place stinking of sweage today....After going to the bar to find out where my sandwich was, I finally managed to get them to bring it to the table. The bread was dried out on one side, but I was prepared to let that go. After 2 bites midst conversation, I realised that the sandwich was cheese and pickle, not the cheese and ham I'd ordered. Then the penny dropped that it was the very same sandwich my colleague had returned to the kitchen 20 minutes earlier as it was not what he'd ordered. Another person in our party had also not got her meal yet.I took the sandwich back to the bar, showed them it was stale, and said it was not what I'd orderd. The response? Not the apology I'd expected. Oh no! Instead what I got was a diatribe that we were diorganised when we ordered our food and when they brought it out, no one accepted the sandwich.... hardly surprising the latter, since no one at our table had ordered it! !I challenged the so-called gentleman behind the bar asking him if he was blaming the customers for their mistake. Again his winning response was "Why not? You can blame us, so we can blame you". Why would you work in a service industry when you clearly don't like people, and have no concept of service? Appalling on every count Queen't Head, and this after over-charging me the week before!!!! Can you give a pub less than a star?? I'm with you run dmc. Staff are downright rude and when they make a mistake with an order think it's acceptable to blame the customer. I for one will not be going back and will be doing everything in my power to get my colleagues to join my boycott. Look out for a facebook group "Boycott the Queen's Head in Hammersmith". Aside from all this, the place smelt of sewage at lunchtime today! Save your money and time for elsewhere. This pub looks everything it's not. Quaint and very traditional venue that says everything about typical country English pubs. However, getting served is a serious mission and once you order from the somewhat hap hazardly priced menu the food is extremely disappointing. Don't complain though as it will fall on deaf ears. It's not all bad though as there are plenty of other very nice pubs in this area which will serve your rightly and leave you and your pocket smiling!! I live nearby in Brook Green and I have always like going to the Queens Head pub. I have always found the staff frendly and there is a very cheerful young manager that works there who has great people skills. As for noisy punters I dont know as I have gone in mostly at off peak times when its not too busy, , but I have happily spent many an occasion here on my own; sometimes just for a coffee and snack, other times for a meal. (the food is varied and good) I have taken work with me or just escaped to this country like inn for a break, enjoying the cosy ambience and the music which is not too loud. As a female I tend to prefer cafes to pubs when it comes to going somewhere on my own but being in the Queens Head feels very comfortable. I disagree slightly with all the other reviews aside from ‘the view’. This is a good pub that could be great, I have been on a number of occasions as I like the beer garden and traditional feel to the pub. However the staff are definitely letting the place down. On the number of occasions that I have been to the Queens Head the service has bordered on down right rude. I am often made to feel as though I am a huge inconvenience to staff when politely asking for a drink even when I am the only person at the bar. On one occasion a friend was at the bar when a staff member asked what nationality he was, after telling the staff member he was told that ‘people from his country had no manners and were rude’ my advice to this staff member and management would be to mind your own business, take a look in the mirror and maybe try serving people with a smile. Aside from having to interact with disgruntled staff, I usually enjoy a few lazy pints and a good meal at the Queens Head. The Queens Head is a Jekyl and hyde establishment. Its staff are friendly, that doesn't change. But the Queens Head food can be top notch and also a dissapointment. There is a wide choice to eat but I think it depends on who is the cook on the day if your serving is above or below average. The Queens Head was packed when we went in, and had a great atmosphere! The pub is well lit, and the chalk boards with the seasonal menu was easy to read. We got a table with not much problem, and the food arrived in pretty quick time. The waitress was nice, but her English was not great, which was my only issue with the place. The food at The Queens Head was really good, the red Thai chicken curry and the salmon was fantastic, the chicken dish not so great. I would definitely recommend this for a cosy get together, and also a Christmas party. In my (humble) opinion Simon's review of The Queen's Head is entirely unfair. I live locally and have spent many a happy afternoon and evening either tucked up inside with a mulled wine in the winter or chilling out in the sunny beer garden during the summer. 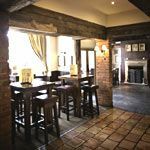 I have always found the staff to be courteous and the food to be excellent - yes, it can get busy, especially at the height of summer, but what gastro pub doesn't? And as for the grunting ignorami who refuse to give up their seats - come on Simon, I can't imagine they would want you sitting next to them with all your grumpy mutterings! Give The Queen's Head a break, it's lovely. The Queens Head is a great pub. Excellent food, a lovely atmosphere and generally very friendly people. I go there as often as I can and would recommend it to anyone - especially in summer when you can sit out in the lovely beer garden! Great pub - friendly staff, quick service, good food, and the beer garden is lovely. An oasis of decency amongst the vile chain pubs and pikey bars of Hammersmith. Highly recommended. Admittedly the Queen's can be full of the most annoying type of punters - it has to happen somewhere. Mind you, if you turn up and there aren't any about then it's a decent enough pub really.